While Prime Minister Justin Trudeau’s recent trip to China may not have gone as planned, the PM is about to leave the country with at least one highlight. On Wednesday afternoon, the Prime Minister’s official Twitter account shared a picture from the Fortune Global Forum, currently underway in Guangzhou, China. 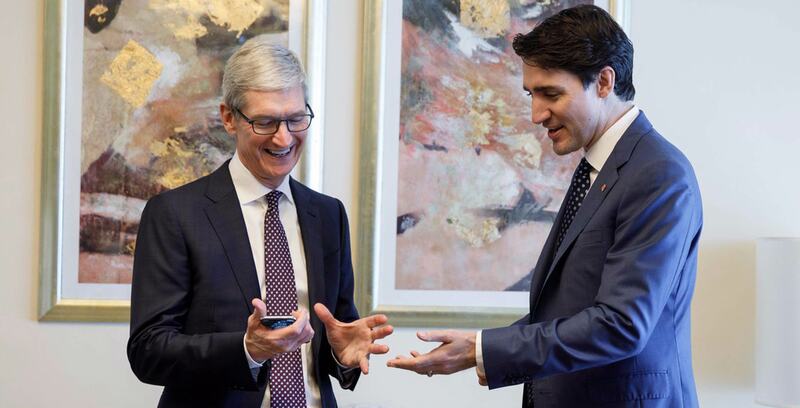 In the photograph, we can see the PM and Apple CEO Tim Cook sharing a light-hearted moment, with the iPhone X clearly pictured in Cook’s hand. As these type of tweets so often do, Trudeau’s message attracted a variety of amusing responses. The best came courtesy of none other than a Jony Ive parody account, who helped provide some much-needed perspective (aside: at this point, the ‘Not Jony Ive’ parody account is probably more real than the disembodied voice that ‘shows’ up to Apple’s keynotes). Of course, the two also talked about more serious stuff, with Trudeau reporting that he spoke to Cook about how they can get more women and girls into coding and the STEM fields. Always the woke feminist, our prime minister. Did Cook subtweet the current President of the United States of America? Probably not, but what does seem clear is that Cook appreciated chatting with a politician that actually understands technology for a change.